Lock in a great price for Rum Magic Camp – rated 9.2 by recent guests! Staff were very professional, very responsive and caring. Excellent camp with great service & attentive staff. Enjoyed the camel ride & food. This place is beautiful and totally worth it! it was just like their pictures, very clean with great shower facility in the middle of nowhere. The food & service are splendid! A group of young locals showed us their great dancing skills till approximately 21:00, no music after that. A cup of Bedwin tea under million stars was very special. We loved this place! I love the panoramic view of the tent, very clean, very comfortable. Personal very friendly, we stayed just one night but it was great! At night we have a very tasty and typical Jordanian dinner, there is a very festive atmosphere, playing music and even have a dance floor. Nice camp at the desert. Easily accessible by 2WD car. Helpful staff. Great location & food. The public area is clean & neat & the people are very friendly. The breakfast was fresh & tasty. I had a comfortable sleep on a fresh linen. The shower was hot & refreshing. The cristal clean linen, hot shower & tastiest food is a great advantage. The genuine hospitality & high quality service made my day! 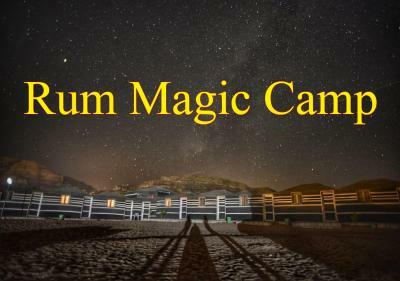 Offering a bar, Rum Magic Camp provides accommodations in Wadi Rum. Complimentary WiFi is featured. Guests at the lodge can enjoy a buffet breakfast. There's an in-house restaurant, which serves a variety of Middle Eastern dishes and also offers halal options. The nearest airport is King Hussein International Airport, 44 miles from Rum Magic Camp. When would you like to stay at Rum Magic Camp? House Rules Rum Magic Camp takes special requests – add in the next step! Rum Magic Camp accepts these cards and reserves the right to temporarily hold an amount prior to arrival. Please inform Rum Magic Camp of your expected arrival time in advance. You can use the Special Requests box when booking, or contact the property directly using the contact details in your confirmation. Even the public toilets were extremely clean! We had no water pressure for a decent shower, wi fi signal was very poor at the tents and the last thing, which I really find unbelievable is that coffee is not available at the breakfast, you have to go to the bar and actually pay extra for it. Can you believe that? I've been to a lot of places but this is the only one that doesn't include coffee in the price of breakfast. Was amazed how great the service could be in the middle of the desert. Fantastic people, yammy food, spacious room with fresh linen. Enjoyed every bit of my stay, especially the authentic quiet atmosphere. Highly recommended Rum Magic Camp! Very loud music and colored lights, killed the desert ambience totally, not very romantic at least. I liked everything at Rum Magic Camp. Everything was ok. One nuance: You need to be ready for the cold nights in the desert. So beautiful views around camp.